The one time defensive stalwart has been out of action for over a year now, sadly after a rough time with injuries generally. He’s now back in light training and whilst he won’t be playing again this season he will be looking for a good pre-season when he can impress the manager sufficiently into keeping him on board. Transfer rumours are bound to emerge in circumstances such as these and he has some big selection issues to overcome following the arrival of Fabian Balbuena and Issa Diop along with Angelo Ogbonna’s vastly improved form of late. With a contract in his pocket until 2023 the Hammers would be in the driving seat in regard to fees and in footballing terms he’s not old at 30. 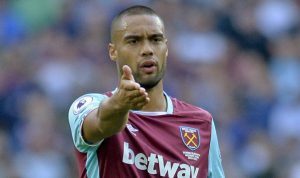 However, a fit and fully recovered Reid has to be a major asset to the Irons and we are keeping our fingers crossed he can truly return to his best. Meanwhile Mark Noble has revealed the central defender’s top attitude towards his problems declaring in his London Evening Standard column: “Winston has been another long-term casualty but he seems to have taken it into his stride a lot more than other players I have seen. If we can sell him move him on imho he is on huge wages considering his ability and injury record.